Including Alaska Natives and establishing a fund to stabilize Arctic infrastructure could make oil drilling less disruptive. Think back to 2015. The price of oil is just above $30 per barrel, down from over $100 per barrel just a few months earlier. Resource extraction-dependent countries across the world, such as Venezuela, are feeling the pain. But so is the Arctic. Specifically, the state of Alaska, where oil and gas revenues comprised 90 percent of the state’s discretionary budget, and funded annual dividend checks to Alaska residents. 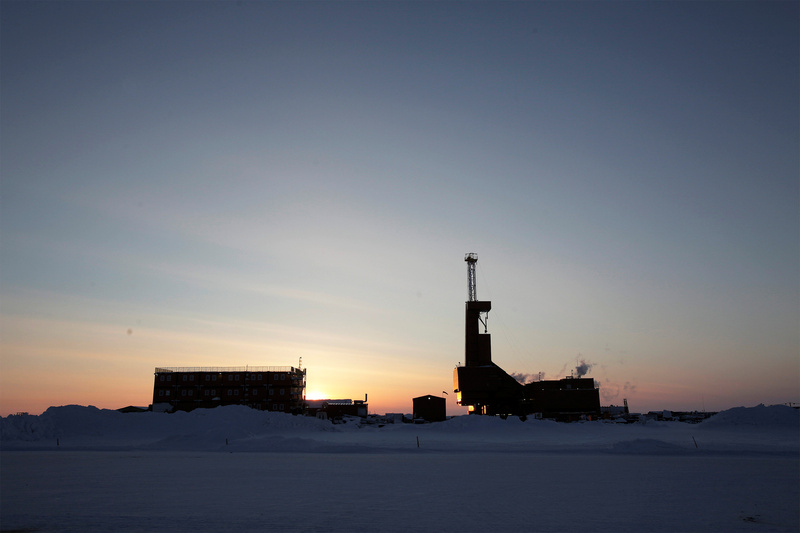 When oil prices plummeted in 2015, the state could barely cover a third of its budget, and many of the state’s most vulnerable residents, including Alaska Natives, were the hardest hit. With Alaska so dependent on oil and gas revenue, efforts to push out industry in the name of carbon dioxide emissions risk being construed as a prioritization of the polar bears at the expense of struggling Alaskans. In order to phase out oil and gas successfully, Alaska must first address issues of inadequate infrastructure investment, poverty, ethnic marginalization, and lack of opportunity that made states like Alaska so dependent on a monolithic industry in the first place. As global warming progresses and Arctic sea ice melts, more resources — including oil and gas reserves — become accessible for extraction. Alaska and other Arctic governments must consider how to manage these natural resources to avoid becoming further reliant on an inherently volatile and finite hydrocarbon-based industry. It is imperative that Arctic governments focus on options diversifying away from a cyclical fossil fuel industry that is accelerating climate change. For Alaska onshore oil and gas development, I propose a two-part approach to resource extraction that centers around Alaska Native inclusion and economic diversification. Let’s mandate that all oil and gas projects in Alaska must offer a 2 percent project equity option to the local Alaska Native Regional Corporation, including them as an operating partner. The local villages and populations, many of whom have lived in the area for hundreds of years, can offer invaluable expertise on how to operate and navigate the Arctic environment. They can also provide employees, emergency response training, and other key operating assets. The project option offers a sustainable source of cash flows over the life of the project, not just a one-time payment. This equity allows the revenues to flow down to the village corporations, and across all the other regional corporations through revenue-sharing legal mechanisms already baked into the Alaska Native Claims Settlement Act via section 7(i). How do we ensure compliance? If producers want to qualify for Alaska’s generous production subsidies and tax credits, this ought to be a prerequisite. Let’s establish an infrastructure stabilization fund, funded out of oil revenues. Currently, royalties go into the Alaska Permanent Fund — 25 percent is distributed to residents via annual dividend checks, and 75 percent is invested. Let’s take some of that 75 percent and earmark it for infrastructure buildout today — roads, sewage, fiber optics, diesel efficiency, transmission and distribution, weatherization — all of which can stimulate economic growth and diversify the non-hydrocarbon economy. Many countries with rich oil and gas deposits end up falling prey to the “resource curse,” where their entire economies subsist on hydrocarbon revenues and their other sectors grow weak and uncompetitive. When the price of oil inevitably falls, these countries realize their fatal dependency on a volatile and cyclical industry. By investing in infrastructure, Alaska has an opportunity to take oil revenues and build a backbone that will foster a thriving economy in everything from tourism to film to data centers and processing. We saw firsthand what happened in 2015 when Alaska faced the consequences of its reliance on a monolithic industry. If the pathway forward must include resource extraction, we must include Alaska Native populations and utilize those oil revenues to build a healthy, diverse, and non-dependent economy. Michelle Chang is a current Master of Public Policy candidate at the Harvard Kennedy School, studying energy and environmental policy.